If you have the urge to try your hand at whistle-making, you'll probably find it much easier if you have a pre-made mouthpiece to start with. You'll find that PVC, copper, brass and aluminum tubing are among the most popular materials for the bodies of home-made whistles. Pictures below are not to scale! Susato "Kildare" S-series Soprano Mouthpiece Shown (for 5/8" diameter body). Other Kildare Mouthpieces are also available below. Susato "Oriole" S-series Soprano Mouthpiece Shown (for 5/8" diameter body). 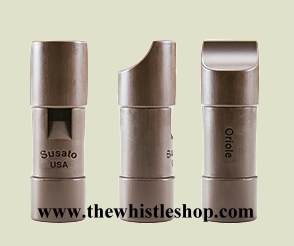 Other Susato Mouthpieces are also available below. These are mouthpieces only (they do not include the whistle body), so they are not playable by themselves! For a full selection of ready-to-play instruments, see our Online Catalog. "How I Made a Pennywhistle at Home in my Spare Time"
Making a Key of D or C "Infra-Whistle"
"How to make a Low D Whistle in a few hours"
"Instructions for making a copper pennywhistle in the key of D"
You'll be able to change quantities if needed once the items are in your Cart.